Should You Keep Your Current Home as a Rental When You Move? There are many reasons why it might be time to move, but the big question is: What should you do with your current home – sell it or keep it as a rental? With rising home values in our area, it might be a smart financial investment to hold onto the home you own and rent it out as an investment. But, how do you know whether that’s the right decision for your particular situation? Is this profitable? A GOOD real estate investment is cash-flow positive. Figure out how much you’d receive in rent, how much you’d pay in expenses and see if the net is positive. Also check with your tax accountant to determine what is best for your particular tax situation. When it comes to investment property and taxes, one plus one, does not always equal two. Do you have the cash available for a down payment and closing costs? If you don’t sell your home, will you have these necessary funds to purchase a new home? Will you qualify for the loan if you keep your current home and buy a new one? Lenders determine what you can afford based on your total debt including the new home. Even though you think you might be able to swing it, you really have to discuss this with your lender first because they may not count all the rental income upfront and have other qualification factors that you’ll need to think about. Does this make sense in the local market? 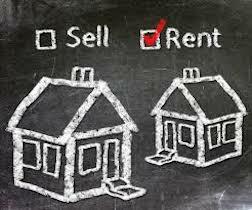 Is the current demand better for rental properties or homes for sale in your particular neighborhood? If so, at what price or rental rate? Will this be a good investment down the road? Look at comparable sales and rental prices in the area. Are they rising or falling? Is your home rental sell-ready? Do you need to make improvements to the home in order to attract renters or buyers and comply with housing codes? What improvements should I make to my home? Don’t make any improvements above what is necessary, until you have more information. Painting and cleaning are the most important tasks. There are also professional cleaning services that will “turn a unit”, meaning they’ll make sure it’s ready for the new occupants. What does being a landlord entail? Becoming a landlord involves educating yourself on the law, obtaining licenses and documents, finding tenants and maintaining the home. Make sure you understand and are comfortable with what is involved. Should I hire someone to manage the property? Being a landlord can be a lot of work, depending on your property, your tenants and how far you live from the property. You could hire a property management company to do the every day tasks, but keep in mind that that is an added expense. Make sure you factor this into your numbers. What else may change? Some jurisdictions have different property tax rates for owner occupants vs. landlords. Speak to your accountant and real estate agent to find out what else may be impacted when you are no longer an “owner occupant”. Now that you know more about your options, you’ll want to sit down with a professional to go over the specifics for your situation and the real estate market. It’s easy to calculate the financial aspect, but be ready to really consider the personal investment you’re making as well. Just know – there is no “right” answer, only what makes the most sense for you and your real estate goals.